Below are scrapbook items we obtained from people with Mineral connections. Hope you enjoy them as much as we do! To submit items scan and send them to dpnanninga@comcast.net . 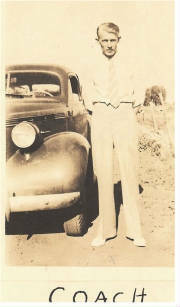 Carroll “Swede” Carlson played boys’ basketball for the Leopards from 1933-1936, serving as Captain for one of the seasons. An attached newspaper clipping records one of the victories for the 1934-35 team. But like most Mineralites, Swede’s fascination with Mineral High School boys’ basketball did not stop with his graduation. He attended games with his high school sweetheart and eventual wife, Cleo Dyer, whenever possible. When World War II began, their focus as well as a nation’s focus was diverted from high school athletics. Mineral Leopards fans have heard about the teams of Coach Joachums. But he was off fighting a war in 1943-44; a small town as well as a nation, needed diversions. High school athletics seemed to fill the bill. In 1943 Swede was working as a Department of the Navy inspector, living with his wife and baby daughter in Kewanee, then Canton and then Peoria. But his and Cleo’s heart remained in small town America, a.k.a. Mineral. So they brought their baby daughter back to Mineral whenever possible. On one of those visits, Swede was asked to volunteer coach the boys’ basketball team of his alma mater. What could he say? Of course, he would do what he could within the parameters of his part in the war effort. 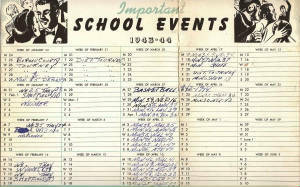 Thus began the interesting academic/sports year of 1943-44 for “Coach” Carlson and his new team. (See photo of “Coach” Carlson as shown in the 1944 Mineral Leopards yearbook.) Swede, Cleo and baby daughter Sandy came back to Mineral for games and the occasional practice after regular working hours. Quite remarkable considering the gas rationing issue of the day. Swede and Cleo rode school buses to games while "Gramma" watched a growing baby girl. 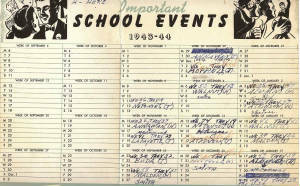 The schedule was fairly full (see school events for 1943-44). They bonded with that team of small town boys. 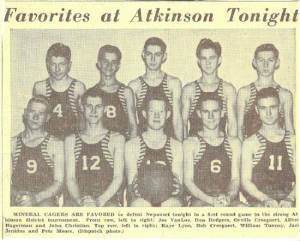 A team that advanced to the finals of the 1944 boys’ basketball district tournament, losing to Atkinson (see article). 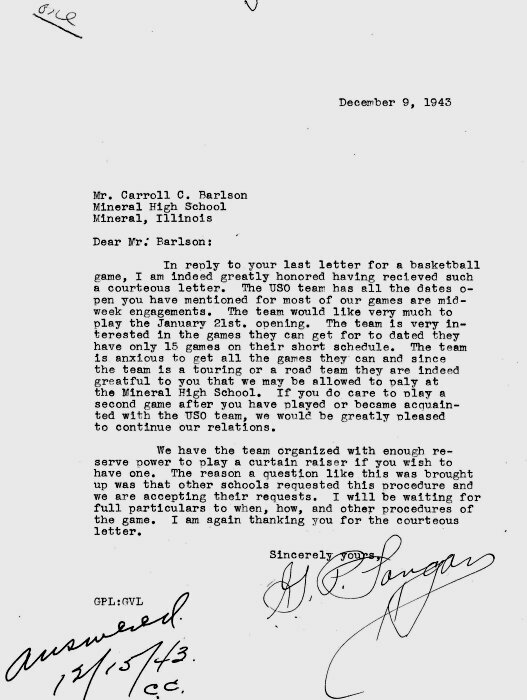 A team that played an exhibition game with a United Servicemen’s Organization (USO) team in January 1944 (an idea proposed and coordinated by Swede as shown in a letter from the USO). A team that can be characterized as a bunch of small town boys who fought on the basketball hard court – fought to uphold the Leopard legend – fought to honor a small town tradition – fought to divert their fellow citizen’s focus toward community activities and sense of oneness. What a wonderful hallmark of one of the great Leopard teams. See the photo for digital images of those young representatives of small town Americana at its best.